Confession time: I only own one bottle of Frederic Malle fragrance, and I’ve never reviewed it. As perfume writers go, I’m a terribly untimely one, I know. I shall review my (tiny) bottle of Bigarade Concentree one day, but in the mean time I’m having far too much fun reviewing the more peripheral products of the range, some of which are so lovely, they have made me gasp. 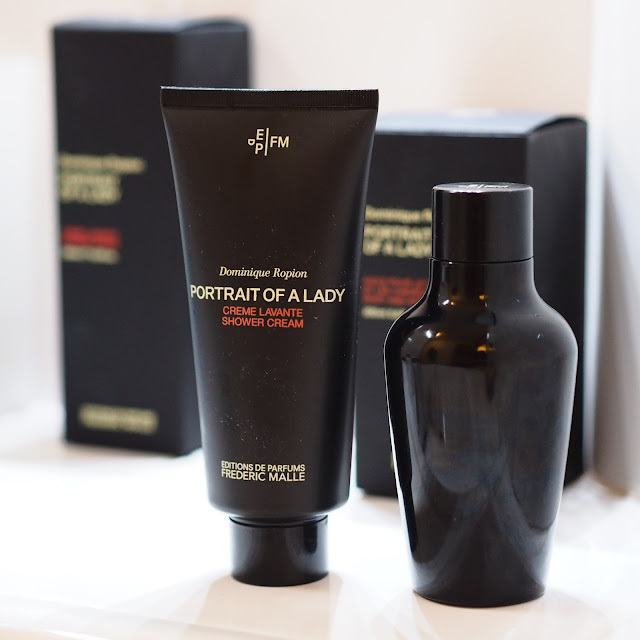 Like these, the Shower Cream and Hair and Body Oil from the Portrait of a Lady line. Editions de Parfums Frederic Malle’s Portrait of a Lady is not a fragrance I’ve overlooked in the past so much, as simply thought wasn’t for me. Too sophisticated, too dark, too … well, ladylike. Lipstick Rose, the bright and bubblegum-pink confection of rose and violet (smelling of nothing so much as a waxy lipstick from the fifties, or your grandmother’s bowl of dusting powder on her dressing table) has always been, for me, the defining rose fragrance of the Frederic Malle range, and I’ve been caught huffing it in a slightly demented fashion by more than one Frederic Malle stockist in several countries. Why I’ve just never bought a bottle is beyond me, but I think I just love winding shop assistants up. 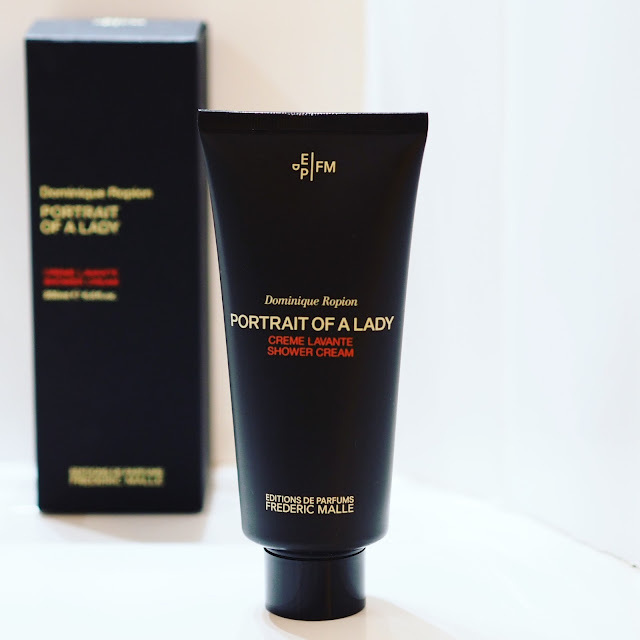 ANYWAY, someone mentioned that there was a hair and body oil in the Portrait of a Lady range, and I thought that was a marvellous idea. PoaL is an oddity in that is a huge, dark and deep fragrance – a red and black rendering of rose, writ large in smoke and fire – but one that also remains remarkably close to the body, lacking the wide sillage you’d expect from the ingredients list. I thought an oil would be an excellent way to experience the fragrance again. 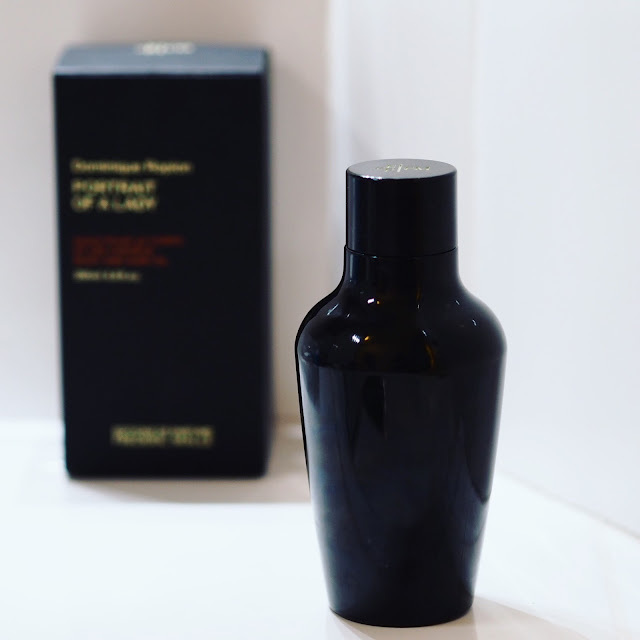 I was surprised by the starkness of the bottle when it arrived, but as the Frederic Malle line is all about the contents, not the packaging of the fragrances, then I guess I shouldn’t really have been. The oil itself is light in texture yet deeply, headily, fragranced, delivering a story of darkest burgundy rose, set amongst a bouquet that also includes cinnamon, frankincense and deep resonant – yet surprisingly clean – patchouli. It’s a scent that’s at once velvety, smokey and (I find) somewhat leathery, a supple Spanish glove-leather, which is unlined, so you can experience both the sensual suede and smooth leather against your skin. It’s beautiful. And yet, not as ladylike as I remember, I find myself wondering what it would smell like on my husband. I’ll probably never know, as one look at the name, and he’ll run a mile, which will be a shame for the both of us. However, if you do want to layer your fragranced products, then there is also the hydrating Shower Cream, which is identically scented to the oil, and produces a rich and creamy lather in the shower without stripping the skin. It’s heady stuff though (as is the oil), and you need very little to scent your skin gently for the whole day. Perfect for Christmas presents, the Shower Cream retails at £40 for 200ml, and the (organic!) body and hair oil retails at £130. A big investment, possibly, but what price beauty? They’re available from Selfridges, Les Senteurs, and Liberty.